Larger and more durable than the original Magic Eraser. Fresh scent of Febreze® added in the eraser. 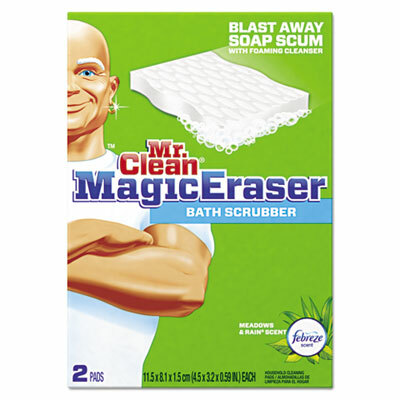 New and improved Magic Eraser is larger and more durable than the original. Built-in soap-scum-dissolving cleanser makes cleaning bathroom messes easier than ever. Slow-release micro-scrubbers help you power through the toughest stains. With the fresh scent of Febreze® added in the eraser. Click here to see more Sponges! Width: 4 1/2" Height: 3 1/5"